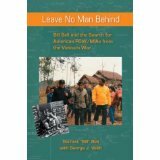 Leave No Man Behind: An eyewitness account of the Vietnam War from its early stages through the last day of the Republic, 30 April 1975. A startling new look at the postwar era and the issue of America's unreturned veterans listed as POW/MIA, an issue that has haunted America since the beginning of American involvement. Shrouded in controversy, a subject of great emotion amid charges of governmental conspiracy and Communist deceit, the possibility of American servicemen being held in secret captivity after the war's end has influenced U.S. policy toward Southeast Asia for three decades. Now, the first chief of the U.S. Government's only official office in postwar Vietnam provides an insider's account of that effort. The challenges he faced in dealing with U.S. politicians, including Vietnam veterans, Senators John McCain and John Kerry, are an ardent reminder of the many similarities in the bloody wars fought by American troops in both Vietnam and Iraq-Afghanistan. In an illuminating and deeply personal memoir, the government's top missing persons investigator in Southeast Asia, who later became a member of the U.S. Congressional Staff, discusses the history of the search for missing Americans, reveals how the Communist Vietnamese stonewalled U.S. efforts to discover the truth, and how the standards for MIA case investigations were gradually lowered while pressure for expanded commercial and economic ties with communist Vietnam increased. Leave No Man Behind is the compelling story of a dedicated group of professionals who, against great odds, were able to uphold the proud military traditions of duty, honor and country. As the US Marine Corps helicopter lifted from the roof of the American Embassy in Saigon at daybreak on April 30, 1975, I thought about the carnage that would result from a heat-seeking missile fired by Vietnamese Communist forces gradually encircling the besieged capital of the dying Republic of Vietnam (RVN). Exhausted by a lack of sleep for the previous several days, I no longer felt fear, only curiosity. Tears welled up in my eyes, perhaps due in part to the anguish of witnessing the tragic events unfolding before me, but also from caustic smoke belched out of rooftop incinerators glowing cherry-red from reams of frantically burned secret US Government documents. Feeling a sense of relief, I nevertheless harbored an even stronger sense of guilt. On the Republic of Vietnam's final day, as I looked down into the gradually diminishing compound and into the terrified eyes in the upturned faces of hundreds of Vietnamese nationals and citizens of other countries friendly to the United States, who were being left behind, I knew that I would be haunted for many years to come. As the venerable 'Sea Stallion' throbbed its way through the damp morning air toward a helicopter carrier anchored off the coast at Vung Tau, blazing multicolored tracers rising from the dark-canopied jungle below bade farewell to America and to an era known as the Vietnam War. During the more than 30 minute flight into the future I sat angry and confused after some 10 years of involvement with a faraway place called Vietnam. I wondered whether the sacrifices in lives and national treasure made by America had been worthwhile or in vain. After contemplating the issue for many years, I believe it is now time to take stock of the American War in Vietnam so that Americans, especially those of us who served there, can finally decide whether or not we now have cause for a celebration or the lingering agony of defeat. With the fall of the RVN, as many analysts had predicted, jubilant communist forces quickly invaded and occupied the populated areas. Hundreds of thousands of former military and civilian officials were required to be screened, classified and registered as enemies of the revolution to be detained in remote, isolated concentration camps under horrific conditions. Thousands died due to disease and malnutrition, many never to be heard from again by family members. At the same time, the communist leadership insisted that the Democratic Republic of Vietnam in the north and the Provisional Revolutionary Government in the south be united as one. From that day forward, according to the constitution, only one political party, the Vietnam Communist Party, would be allowed to exist. On official letterheads of government stationery the three previously used terms comprising the national motto of the communist north: 'Freedom, Independence and Democracy' were changed forever to read 'Freedom, Independence and Happiness.' To the Vietnamese people this change in terminology, especially the reference to happiness, would provide one of the few sources of humor during a desperate time. To add insult to injury, the graves of fallen RVN military personnel were razed by bulldozers in cemeteries across the country. Typewriters, radios, televisions and anything that could be used for propagation or communication were required to be registered with the 'Military Management Committee' responsible for political security under the new 'Socialist Republic of Vietnam.' As interest began to wane, occasional references to the Vietnam War coined phrases such as ‘a noble cause' or 'an unnecessary war.' The question as to whether the Vietnam War was or was not necessary was just as divisive in postwar debate as it was during the days following the 1968 'Tet’ Offensive. In my own assessment of both the necessity for and the outcome of the Vietnam War two primary considerations were the U.S. national interest at the time and the mission of the U.S. Military Forces that fought in Southeast Asia. At the beginning of the War in Vietnam, the basic mission of American soldier worldwide was to kill, destroy, or capture the enemy, or repel his assault by fire. Over one million men and women answered their nation's call, and they did their level best to carry out their mission in Southeast Asia. As a result, some 58,000 Americans and some 225,000 allied personnel made the ultimate sacrifice, while by comparison, communist Vietnam suffered the loss of over 1,300,000 personnel, including 150,000 personnel who were killed-in-action but never recovered. I personally witnessed the strongest blow struck at communist forces by hard-fighting American and South Vietnamese troops that occurred during the January 31, 1968, 'Tet' offensive. The bodies of thousands of communist personnel were stacked in piles around installations throughout South Vietnam, and losses were so heavy for the communist side that the entire military rank structure was temporarily abandoned and cadre selected to command and control units were assigned based on position or job title only, rather than actual military rank. The loss of life to the communist side was nothing less than staggering, and any U.S. military commander whose losses approached even a small percentage of actual communist fatalities at that time would most likely have been relieved of command. Even though America's servicemen and women fought valiantly during the 1968 'Tet' offensive, the U.S. and international media nevertheless managed to reshape their hard-earned victory into a political defeat. Vietnamese communist propaganda experts were so skillful that they were able to convince many members of the media and even some military analysts that two separate governments, the National Liberation Front in South Vietnam and the Democratic Republic of Vietnam in the North, existed side by side and that both were involved in a 'civil war.' It has since been proven that both the NLF and the DRV were tightly controlled by the Vietnam Communist Party and both governments were actually one and the same. Moreover, personnel of the two purported military organizations of both illusionary governments, the North Vietnamese Army (NVA) and the Viet Cong (VC), were in reality members of the Peoples Army of Vietnam (PAVN). Admittedly, in terms of national treasure the Vietnam War was not cheap. Depending on which expert's figures are used, the total cost of the Vietnam War to America was somewhere in the neighborhood of 250 billion dollars. By comparison the overall U.S. defense budget during postwar, peacetime years exceeded that amount annually. In reality one million men could not have been trained at U.S.-based training centers for a 10 year period, even using blank ammunition, for a lesser amount. While the Vietnam War was certainly a drain on the U.S. economy, during the decade of our of engagement there the former Soviet Union also provided significant amounts of financial and material support to communist forces deployed throughout Southeast Asia. Support by the USSR to Vietnam, the 1979 invasion of Afghanistan and a badly managed, centrally controlled economy all combined to bring the former Soviet Union to its knees and bring about the collapse of the Communist Party. Ultimately this collapse led to the end of the Cold War. Veterans of the Cold War, especially those who fought in Korea and Vietnam, now enjoy the gratitude of the peoples of many European, East Asian and Southeast Asian nations. It is now clear that as a result of the sacrifices made by American and allied veterans, today the people of Thailand, Malaysia, the Philippines, Singapore and Indonesia are living under freely elected governments. This accounts for one quarter of the earth's population. Radical Muslims bent on Jihad should pause to remember that the citizens of the two largest Islamic nations, Malaysia and Indonesia, are able to freely worship Islam due in large to the sacrifices made on their behalf by Americans fighting against Communism throughout Southeast Asia. Obviously, the true losers of the Vietnam War are the Vietnamese people, not just the people of the former Republic of Vietnam, but citizens from all areas of the country, including the north. Although millions of Vietnamese 'voted with their feet' by escaping on small boats across dangerous ocean currents, resulting in staggering losses to mankind, today millions more freedom-loving Vietnamese still yearn to be free. I believe that the two most important bilateral issues remaining between the U.S. and the Socialist Republic of Vietnam are an accounting for the almost 1,800 Americans still missing from the Vietnam War and democracy for the Vietnamese people. Successive administrations in Washington, D.C. have pressed for democracy in many countries around the world, including Russia, Haiti, South Africa, Afghanistan and Iraq. But there has been very little interest shown in gaining democracy for Asians, and this double standard is difficult to understand. It is almost as though we Americans have a collective mentality whereby we believe that peoples with yellow skin cannot manage freedom, and that tight control is the only option available. The American business community, aggressively buying up cheap products manufactured in Asia for resale on the U.S. market, is blinded by the lack of labor unions, cheap wages and fear of violent reprisals against labor strikes. It is ironic that after some 58,000 fine young Americans died in Vietnam while fighting for democracy the American business community is now steadily developing the economy of communist controlled Vietnam, insuring that the Vietnam Communist Party will not only remain in power, but that it will increasingly have the ability to maintain an even larger and more powerful military force. Concerning the plight of the families of Vietnam War POWs and MIAs, democracy can also go a long way to help in this regard. I believe that most Americans, especially Vietnam veterans, will agree that for the most part the Vietnamese people are honest and hardworking. Like our people right here at home, I can't imagine a situation where the people of Vietnam would be willing to hide the remains of anyone's loved one in order to extort money from them. Although during the past 30 years the ruling communists have gradually doled out bits and pieces of skeletal remains and personal effects in return for large monetary sums, once the Vietnam Communist Party has collapsed the Vietnamese people will rise to the occasion and provide whatever assistance is necessary to resolve the issue of our missing men. We should all be doing everything we can to make sure that day comes. Garnett 'Bill' Bell, a native of Texas and a retired GM-14, DoD, went to Vietnam as an infantryman in 1965 and served four tours there. Bell was awarded 20 individual decorations and numerous unit awards. Bell later served as an instructor in the Department of Exploitation and Counterintelligence, U.S. Army Intelligence Center and school. During his career Bell served in the 327th Airborne Battle Group, 101st Airborne Division, the 1/35th Infantry Regiment, 25th Infantry Division, the 2/506th Airborne Infantry Regiment, 101st Airborne Division, the 101st MI Company, the 525th Military Intelligence Group, the Defense Language Institute, the U.S. Army Intelligence and Security Command, the 6th Special Forces Group, the Joint Casualty Resolution Center (JCRC), the Four Party Joint Military Team (FPJMT) and the Joint Task Force Full-Accounting (JTFFA). Bell's wife and son were killed and a daughter critically injured in April 1975, when the families of U.S. officials assigned to the American Embassy in Saigon were evacuated in conjunction with the 'Operation Babylift' program. After being evacuated by helicopter from the roof of the American Embassy on the final day of the Republic of Vietnam (RVN) (30 April 1975), Bell returned to postwar Vietnam as the first official U.S. representative after the war ended when he was assigned as the Chief of the U.S. Office for POW/MIA Affairs in Hanoi. He served more than 12 years on the POW/MIA Search Teams. An Airborne-Ranger and Jumpmaster, Bell eventually became a member of the Congressional Staff, U.S. House of Representatives. Fluent in Vietnamese, Thai and Laotian, Bell is a graduate of Chaminade University and the author of 'Leave No Man Behind.' Bell is a life member of the VFW, Combat Infantrymens Association (CIA) and the Military Order of the Purple Heart (MOPH). Bell is employed as an investigator in the 12th Judicial District western Arkansas. This book is one of the most accurate and detailed accounts of the Vietnam War from beginning to end. It is arguably the very best book ever written concerning the important POW/MIA issue. No one, military, civilian, or private citizen, has contributed as much as Bill Bell to the national effort to recover and repatriate America's unreturned veterans from the Vietnam War. Every veteran of any war definitely needs to read this important work, which is destined to become an icon that will withstand the test of time. Bill Bell certainly deserves the Presidential Medal of Freedom for his courageous efforts." Michael De Paulo, Vietnam Vet, USMC and National Service Officer, Rolling Thunder Inc.